Historically one of Japan's three most famous gardens, Kenrokuen is also symbolic of Kanazawa's cultural richness. Kenrokuen Gardens are a vast green space located in the heart of Kanazawa, Ishikawa Prefecture. This place is one of the main tourist attractions of the city since this park is considered one of the three most beautiful Japanese gardens. For this reason, you shouldn’t miss Kenrokuen if you visit Kanazawa. Kenrokuen’s story is linked to the Maeda family, which ruled over the Kaga domain, the current Ishikawa prefecture. The development of these magnificent gardens was ensured by the successive lords of this important domain, from the beginning of the 17th century until the middle of the 19th century. Although they were from the warrior class, members of the Maeda family were renowned for appreciating art and aesthetics. They’ve long been the second most prosperous family after the Tokugawa shogunal dynasty. It’s this wealth that has enabled them to attract renowned craftsmen and artists to their fiefdom. The Kenrokuen Gardens are one of the most important achievements of the Maeda clan. This park was once part of Kanazawa Castle, the primary residence of this family. Even today, the gardens are connected to what remains of the castle by a bridge. 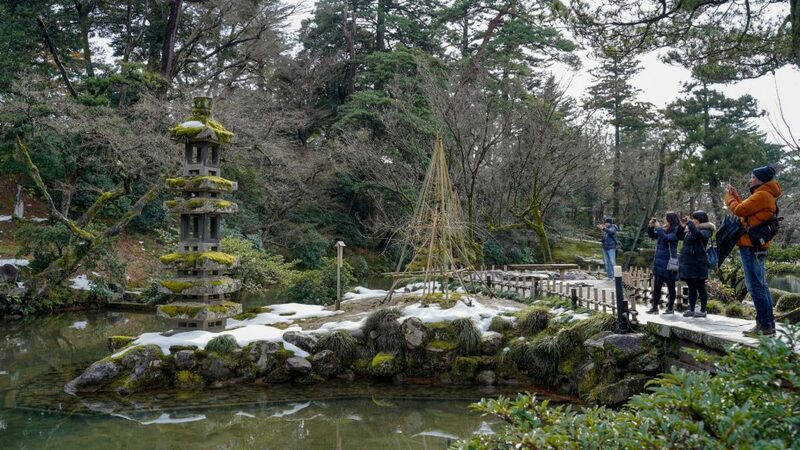 This article answers most of the questions you can ask about Kenrokuen Gardens. Use the menu below to go quickly to the part you are interested in. What to see in Kenrokuen? 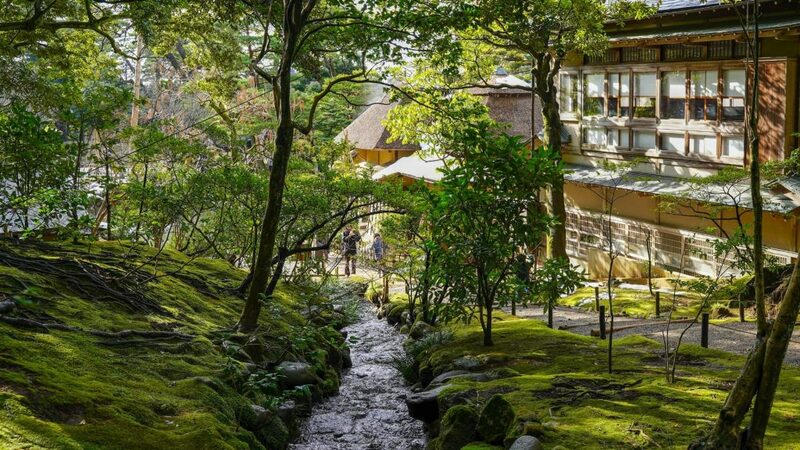 What are the 3 most famous gardens in Japan? Kenrokuen is a huge Japanese garden covering an area of more than 11 hectares on which are planted nearly 9000 trees. The sophisticated arrangements of this park combine 183 plant species. The Karasaki pine is among these trees. It was initially planted by Lord Nariyasu of Karasaki, near Biwa Lake in the 13th century. The park is arranged around a large pond named Kasumigaike. An island is in the center of this large water body. Legends tell it’d house a hermit with magical powers. Honestly, I don’t see where this man could hide since the island is relatively small. Kasumigaike pond in Kenrokuen gardens hidden behind branches and their yukitsuri cables. Photo by Michaël da Silva Paternoster for Nipponrama. Kotoji-toro is the most emblematic element of the Maeda family’s gardens. This lantern has two feet, which is unusual. Its name comes from its resemblance to a bridge on a koto, a typical Japanese harp. But that’s not all since you’ll also find the oldest fountain in Japan in these gardens. This feat was facilitated by the natural pressure of the water that gushes at this place. Ganko-bashi is a bridge famous for its refined form. Its name can be translated as “Bridge of Geese”. This name comes from the shape made by the eleven red stones that form the bridge. Indeed, they are positioned as a group of geese in flight. The park contains several buildings, each with their own function. Yugao-tei is a tea house. It is also the oldest structure of these gardens. Shigure-tei is a rest home. Maeda Tsunanori built it, but this building has been fully restored in the late twentieth century. Finally, the small Kaiseki pagoda, which is on an island not far from the main entrance of the park, was allegedly offered to the Maeda family by Toyotomi Hideyoshi, the famous samurai who unified Japan in the 16th century. One theory is that it was brought from Korea by Kato Kiyomasa. This samurai had fought in Imjin war, one of the Japanese attempts to conquer the Korean peninsula. Kaiseki Pagoda photographed by tourists. Photo by Michaël da Silva Paternoster for Nipponrama. Thanks to these many points of interest, the park is pleasant to visit throughout the year. Visitors can watch the cherry and plum blossoms during the spring. Irises appear at the beginning of the summer. It’s possible to observe the orange leaves of the trees during the fall. In winter, the snow is invited in the park; it’s the opportunity to see unusual structures appear. What are the cables attached to garden trees? The Meiji statue surrounded by trees with yukitsuri in Kenrokuen. Photo by Michaël da Silva Paternoster. In winter you will see many wires attached to the branches of Kenrokuen trees. These cables forming conical webs are called “Yukitsuri”, which means “snow-grip”. They are installed in early November and serve to relieve the branches of the snow weight that is falling in large quantities in the region. This ingenious system preserves the beauty of the park because the trees aren’t damaged by this difficult season. What’s the meaning of “Kenrokuen”? Kenrokuen, “兼 六 園” in Japanese, can be translated as “Six Attribute Gardens”. These six attributes that are defining the beauty of Kenrokuen’s landscapes are the sense of spaciousness, seclusion, artifices, antiquity, watercourses, and panoramas. Before becoming Kenrokuen, this space was used to host a Chinese thinker who had been invited by Maeda Toshinaga, the second lord of the Kaga domain, at the end of the 16th century. Then, it was used to house the servants of Tamahime, Ieyasu Tokugawa’s grand-daughter, the most potent samurai of the early seventeenth century. This princess had become the wife of Toshitsune, the third lord of the Kaga domain. But, these residences were abandoned in the years 1620, when Tamahime died. The construction of Kenrokuen Gardens begins after this event. A stream in the gardens of Kenrokuen. Photo by Michaël da Silva Paternoster for Nipponrama. The first attested trace of the existence of the gardens is the completion of the Tatsumi canal in 1632, under the reign of Toshitsune. Kenrokuen is then used by the progeny of this lord to organize banquets. Unfortunately, the gardens were destroyed by a fire in 1759. Lord Maeda Harunaga began the reconstruction of this green space in 1774. He adds the Yugao-tei tea house to his big project. The park is officially named Kenrokuen starting from 1822. It’s Matsudaira Sadanobu, lord of the Shirakawa domain in the current Fukushima prefecture (so nothing to do with Shirakawa-go), who found this name. He was inspired by the work of Li Gefei, a Chinese poet who defined the attributes of a perfect landscape. The present form of the park is only established in 1837, when Nariyasu, the 13th lord of the Maeda lineage, enlarges the main pond. 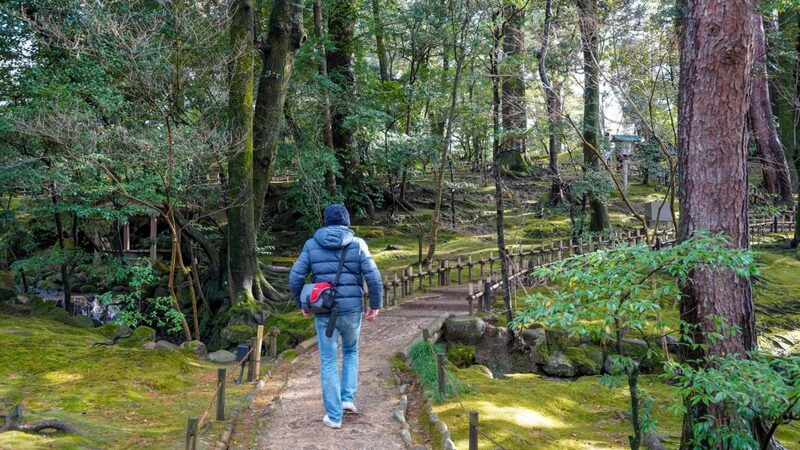 A tourist visiting the Kenrokuen Gardens. Photo by Michaël da Silva Paternoster for Nipponrama. Kenrokuen has been open to the public since 1872. The State Ministry approved the park in 1874. As I said at the beginning of this article, you should visit Kenrokuen Gardens if you go to Kanazawa. This vast green space is a testimony to the richness of the Maeda family. Moreover, it’s a perfect example of a Japanese garden. Besides, this tourist attraction is easy to access. It is a short walk from Kanazawa Castle, to which these gardens were once attached. The 21st Century Museum of Contemporary Art is only a few minutes walk away. Finally, walking around Kenrokuen is pleasant throughout the year. I was able to visit it in autumn and winter, two seasons that are usually not suitable for walks in green spaces, and it was an excellent experience in both cases. 7 AM to 6 PM from March to September, and from 8 AM to 4 PM from October to February. The gardens are open every day. It will take you a little less than an hour to see everything there. 310 yen for adults, 100 yen for minor between 6 and 18 years old, free for people aged 65 and over. Access is free for all during some holidays. Kenrokuen is a 30-minute walk from Kanazawa Station. The area around this station is rather boring from a tourist point of view. But you will not save much more time on the bus. Kenrokuen is located on the main bus lines for tourists: Kanazawa Loop Bus and Kenrokuen Shuttle Bus. In most cases, a one-way trip costs 200 yen. How to go to Kanazawa? Read my dedicated articles to find out how to get to Kanazawa from Japan’s major tourist cities. Kenrokuen is in a very touristic part of Kanazawa. You will easily spend half a day in this area of the city. 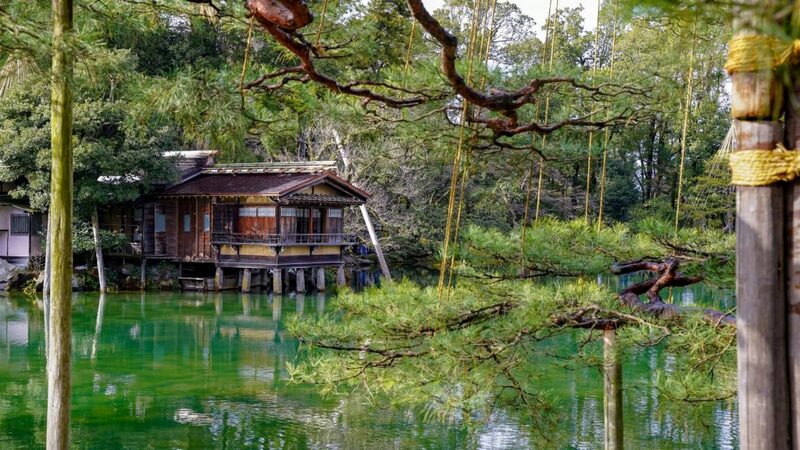 The following three attractions are only a few minutes walk from these gardens in Kanazawa. Very easy to access. You only have to cross a bridge to get from Kenrokuen to the only castle of the Kaga domain. One of the main Shinto shrine in Kanazawa. Its door is Dutch-inspired, which is not typical for this type of building. This museum is located a few hundred meters from Kenrokuen’s main entrance. If you have to visit only one museum in Kanazawa, this is this one. 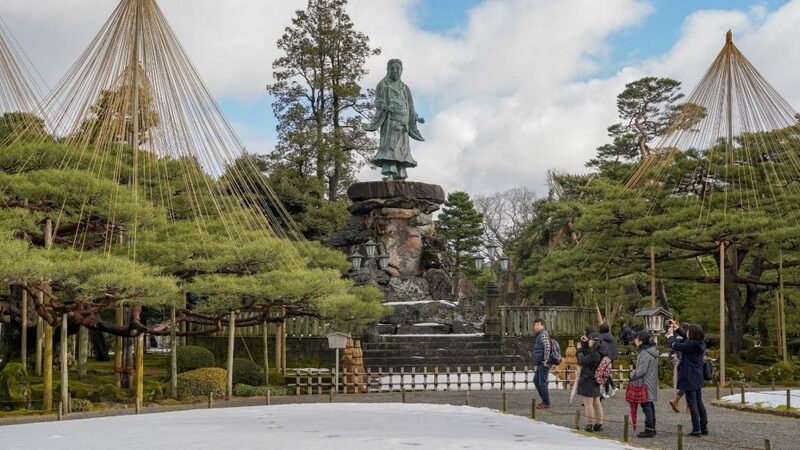 Kanazawa and its surroundings have so many tourist spots that it makes sense to stay one or more nights in this city to enjoy all that it has to offer. Here are my recommendations for hotels in Kanazawa. Located next to Okayama Castle. This garden was built in 1700 at the request of Ikeda Tsunamasa, the lord of the region. Located in a city known for its Confucian school. This garden was created by Tokugawa Nariaki, the lord of Mito.